Outdoor Kitchens are one core aspect of the outdoor living areas produced by The Earthscape Company in the Charlotte, NC market. The Earthscape Company distinguishes itself from other Charlotte landscaping companies by offering projects like an outdoor kitchen in addition to typical Charlotte landscaping applications. When The Earthscape Company’s conceives a plan for a backyard living space involving an outdoor kitchen, they consider it’s placement relative to the home and backyard layout, making sure it “fits” into the existing scheme instead of becoming an “add on”. Also, it’s important to tie the home’s exterior and/or interior features such as stone, stucco, interior design styles and tastes into the proposed outdoor kitchen. 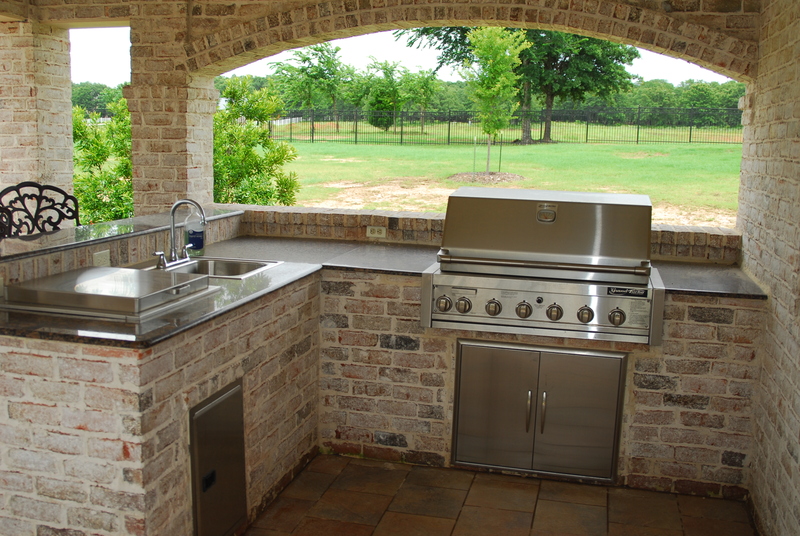 Additionally, fun features such as refrigerators, sinks, ice trays, lighting, raised backsplash bar make an outdoor kitchen appropriate for each homeowner’s lifestyle. Outdoor kitchens are often constructed with integrated landscape lighting and up-to-date fixtures. Having a new landscape lighting system installed with a new outdoor kitchen landscape project can make a home instantly seem 30 years younger on the outside and much more fun. The EarthScape Company is located in Charlotte, NC and services both residential and commercial properties locally. We offer an array of services that will keep your property looking and functioning at its best. We are proud to say that our customers can come to us with all of their outdoor needs. We guarantee you will not be dissatisfied with our service our professionalism and our integrity! Copyright © 2015. All Rights Reserved The Earthscape Company.